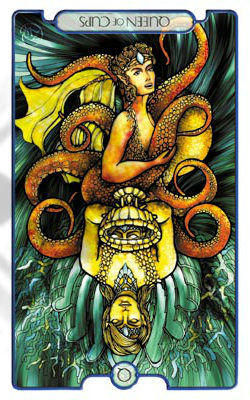 I know exactly how to connect this card to my day in a sweet and whimsical way, which might surprise because the reversed Queen of Cups is anything but whimsical. She is manipulative. She is given to emotional outbursts. "She is a temptress. She pulls on emotional strings. She dances and dazzles with her magic and charms with her flirtatious promises of happiness." These descriptions make me smile because I am thinking of the baby we had the pleasure of babysitting at my house today. She is just a year old, and she had us wrapped around her little finger. She would shriek when she didn't immediately get what she wanted, and she would reward us with huge smiles the minute we complied with her wishes. Babies don't mean to manipulate us, but they've been given cuteness and charm, and our sweet little guest sure had a way of turning a houseful of big people into her servants. It was fun. Ha, yes, that does sound so Queen of Cups-y :) Glad you had fun babysitting! Yes, it's good that you had fun. For me, that would drive me mental!! :) I'm pretty much immune to babies. Ha! Well, I had helpers. My three girls were enchanted with her. So was my husband, but he took a nap for most of the time she was here. lol!